You may not be aware of how many different scrapbook monthly kit clubs are available. If you have a goal of getting more scrapbooking done this year….a monthly kit club might be the answer for you! Monthly kits can speed up the process because you have everything you need to complete layouts right there in front of you! Some kits have layout ideas included…others you can go wild on your own. I have tried several different scrapbook monthly kit clubs and love researching what is out there! These kits are all geared for scrapbooking and I have added a lot of details so you can get an idea if the kit would be for you! ScrapbookingStore.com: They have a monthly ScrapbookingStore.com Kit that ranges in price from $11.00 to $12.99 depending on if you want to buy it month to month or sign up for a 3, 6 or 12 month commitment. Each kit has tons of items in it and lots of inspiration on their blog and social media accounts. There is also an option for an add-on for $7 that includes extra embellishments. This is a very affordable kit with the shipping only $4.99. The website also has a shop where subscribers get an extra 10% off their purchases! I have reviewed this kit and you can read all about it here. Here is a quick video of their kits too! Club SEI: This kit is $25.00 and that includes shipping. The kit creates 10 layouts that are 12×12 in size. Each kit comes with detailed color instructions. There is no long-term commitment required. You can cancel after the first shipment is sent without penalty. This ships out every month and if you purchase this kit and their card-making kit you receive 20% off. This kit does not have a preview and is now called the Surprise! Scrapbooking Kit Club. I recently did a Club SEI Scrapbook Kit Review you may want to read over! The Scrap-Room: This kit has enough supplies to make 8 or more 12×12 layouts. The kits are called Flavors of the Month and each kit comes with a sample pack of coffee! You will have access to full color detailed instructions for the layouts also. You can join the autoship program or try it out for one month for a few extra dollars. The basic kit is $23.95 plus $8.99 shipping. They also have a project life type monthly kit. There are add-on kits for embellishments, patterned paper and cardstock that seem to compliment the main kit. You can skip months without penalty. Studio Calico: This kit runs $34.99 if you sign up for a year-long commitment. You can do a 6-month commitment for $37.99 or just order month to month for $39.99. These prices do include shipping. For an additional $5.00 you can add-on the Scrapbook Kit Workshop. This gives you access to videos with 3 layouts, 3 process videos and 3 inspiring ideas for the kit. You will also get 3 sketches, a digital file and access to a members message board. They also offer a documenter's kit club (like project life), a planner kit club and a new stamp kit club. Hip Kit Club: This kit is $34.95 if you buy month to month. If you sign up for a 3 month commitment the kit price is $29.95. There is no information about how many pages you can complete with each kit and I don't think they include any layout inspiration. You can see layout ideas on their Facebook and Instagram pages though. They also offer add-on kits for embellishments, cardstock and paper. There is a Project Life type monthly kit as well. Cocoa Daisy: This scrapbook kit costs $33.95 plus $8.00 shipping. They offer a patterned paper add-on kit. There is no information about how many pages these kits will complete and no instructions are provided in the kit. Subscribers do get exclusive cut files and printables that coordinate with the kits each month. They offer a Planner Kit and a Day in the Life kit too plus several other add-on options. Elle's Studio: offers a monthly kit that is basically tags and shapes. 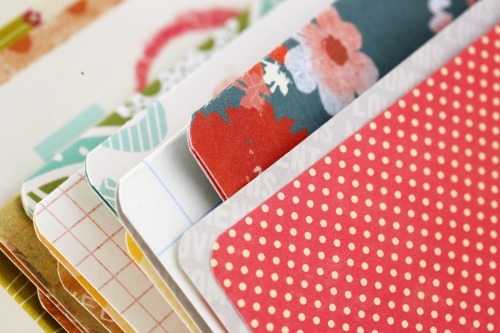 These are great for layouts, cards, mini albums and Project Life. They are very reasonably priced! If you subscribe it is only $12.61 and that includes shipping. Club Scrap: This site has the Club Scrap Page Membership kit that makes at least 8 layouts. It is $21.95 plus $7.95 shipping. You can download step by step assembly instructions so that you can make the most of your kit. The kit may include a stencil, photo mats and other embellishments. Premier Scrapbook Designs: offers a monthly scrapbook layout kit. This layout kit is for a 2 page layout. It comes with detailed assembly instructions and precut paper! The kit is $19.49 plus shipping. Subscriptions are for 6 months. Paisleys and Polka Dots: They don't offer a monthly kit club, but do offer lots of kits that you can order at any time. They specialize in layout kits, mini album kits, wood/altered projects and Bible journaling. The kits range in price and are really cute!! It would be a great way to get your feet wet with mini albums or new to you projects. Citrus Twist: The scrapbook kit runs $32 for a one time purchase, $29 for a 3 month subscription and $26 for a 6 month subscription. If you buy the kit for 12 months you get a free kit your 13th month. There doesn't appear to be any ideas cards included but they do have an idea gallery. They also offer a Life Kit and a Gracebox Kit. Clique Kits: You can order this kit month to month for $34.95 plus shipping. A 3-month subscription is $32.95 plus shipping and a 6-month subscription is $29.95 plus shipping. If you prepay for a 3-month subscription you will save 20%. You get digital cut files and digital printables plus 2 Flair. They offer a private Facebook group and forums. There are ideas for the kits on their blog and social media. They also have some add-on kits for customization options. Noel Mignon: offers a monthly scrapbook kit and a monthly Project Life type kit. They have a subscription program that is 6 months at a time and is full right now. Their kits are HUGE and they are highly recommended! You may be able to get the kits on their site before they sell out. Their Classic Kit is $65.99 and they have a Daily Diary Kit that is $35.99. Felicity Jane: The monthly scrapbooking kit is $35.97 plus shipping for one time purchases. If you sign up as a subscriber the kit is $30.97 plus shipping. These kits look like they always include stamps. There are printables and cut files included each month and the packaging is reusable. My Creative Scrapbook: This site has several kit options. The Main Kit 3-month subscription is $33.50 plus shipping. The 6-month subscription is $31.99 plus shipping. Next is the Creative Kit for 3-month at $29.50 plus shipping and the 6-month at $28.99 plus shipping. The Creative Kit is perfect for scrapbooking children and family events. There is a Album Kit which is geared toward doing mini albums. It is a 3-month subscription for $36.99 plus shipping. Last is a Limited Edition Kit and is offered for 3-months at $42.00 plus shipping or 4-months at $39.99 plus shipping. This looks like a big kit full of really cool stuff! They have some add-on kits available plus other “special” kits from time to time. Members get gifts in their kits 4 times per year. They have a Design Team Gallery where they have layout ideas and inspiration using the monthly kit. Paper Issues: Paper Issues offers a monthly Swag Bag kit that is full of a little of this and a little of that! It is only $9.99 a month plus S/H. It isn't really a “scrapbooking” kit but it full of items you scrapbook with and is a fun assortment of embellishments! Paper Wishes: They have what is called Personal Shopper Subscription Boxes. This is a monthly scrapbooking box full of supplies that coordinate. There are supplies to make at least 8 page layouts plus a card. There are full instructions included for the layouts and card. It is $29.99 plus $5.75 shipping. You also get a free $15 gift for signing up. You can cancel at any time. They also offer some other unique subscription boxes: stencils boxes, template boxes, embossing folders boxes and more. Scrapbook Super Station: They offer a Double Feature Club that makes 4 double page layouts. They include full detailed instructions for making each layout. They include full packages of embellishments so lots of great leftovers. This kit is not a set price and varies each month based on the supplies included. The website says that it is typically $50-60 plus shipping. They show the layouts on the site and they are really, really cute! Quick Quotes: The Page Layouts Kit is $19.99 plus shipping each month. The kit makes 2 double page layouts and comes with complete directions. They also include a “bonus” in each month's kit that includes $10 worth of free paper, ribbon and vellum. They also offer an Altered Kits Club for doing cool projects or you can do their Ultimate Combo Q Kit that is both the Layout Kit and the Altered Kit for $49.99 plus shipping. Embellish It: They offer a monthly kit club called the Layout Kit Club. They offer their main kit, but also an alternative kit if you don't like the main one. If you email in before shipment you can choose the alternate kit. Club members get an additional 20% off other kits and kit clubs the site sells. Shipping is always a flat $7.50 for everything. The kit club is $20 plus shipping and makes 2 double page layouts. These kits ship out every other month and I think you get 2 months worth of kits each time. So you are getting 12 kits…but only shipped 6 times. They also offer a Bible Journal Kit Club and a Planner Kit Club. What is Your Favorite Scrapbook Monthly Kit? I am not personally endorsing any of these kits. A Scrapbook Monthly kit is something very subjective based on the individual crafter! Someone I know may LOVE one kit club….and another friend totally dislikes the same kit club based on how they scrapbook. I will be trying my best to keep this list up to date! Please let me know if there is a kit I am missing or if something changes with a kit that is listed! I would love to hear about the kits you have gotten and what you think of them! Have you ever bought a scrapbook monthly kit? Be sure to check out my big list of Monthly Card Making Kits and Monthly Project Life Kits. Wow, last time I looked I couldn’t hardly find any active monthly kits! Glad to see they are back in style. I’ll look them up and see which I might be interested in. Maybe we can start a monthly scrapbooking linky or something? To help us be motivated to actually get back to it!! Thank you so much for doing the legwork! Yes I was surprised to find so many also! It is so fun to get the kit in the mail each month! I am like a little kid! So many! 🙂 Thanks for sharing all these, will definitely have to explore them further. Let me know if you start getting one and what you think! Thanks Traci! I will pass this along to my readers!! Do you know if there have been any new scrapbook kit clubs started during the past few months? TIA! I haven’t heard of any new kits, but am hoping to do some research this summer. I will let you know if I find anything!! Love that you put this list together. Not sure if you are still updating it. There are a couple I wanted to mention but not sure if they qualify exactly. I will have you check it out and leave up to you. The Stephanie Bernard’s stamps of life has a monthly card kit club. My favorite things started one not too long ago. Catherine Pooler’s Stamp Nation has a quarterly one and sometimes an adhoc one during the in between months. Hero arts also has a monthly kit for card making. Hi Catherine! Thanks so much for commenting and leaving this info. I will definitely be looking into these and adding them to my list. Updating this list is on my to-do list. I was just at a crop this weekend and we were talking about any new kit clubs anyone had heard about! Thank you so much for putting this list together. It is so helpful. I was just on Darcie’s heart and home website and they also have a bi-monthly stamp kit. I will look into it and add it to my list! Thanks so much for stopping by!! Hey Jamie, I stopped by your site today and noticed that Artsy Albums was no longer on your list. Please email me if something happened! Once again, I’d like to offer your readers 20% off their first kit with coupon code lifeissweeter20. I did a full overhaul on my list recently. I only left kits on the list that send out an actual monthly kit. I am working on a separate post for sites that offer mini albums and other unique kits and do plan to add yours to that one! Thanks so much!! I’m so happy to have found this subscription list and it looks like your blog is a lot of fun too so that’s exciting. Thank you for taking the time to put this together. Thanks for stopping by Jessica! Have you ever come across kitaholickits.com kits? They’re Australian based but looks good and they’re monthly too. Thanks for the list it’s awesome!! HI Mandy, I have heard of that kit but I tried to keep my list US based since 99% of my readers are located in the US. I hope you find a new kit you love!